The original title of this article was “God’s Role”, a title which could easily have been seen as a reflective and religious look at the impact God has on the world. In this case however, it is less about the impact God has on the world, and more about the impact that the philosophy and approach towards God has on everything happening and everything that could happen in the future. You can make the argument that the 2 most potentially dangerous people in the world are the ones that believe in God too little and the ones that believe in God too much. I know a number of atheists. The ones I know are generally as decent as anyone else I know. They are some of the best people I know. They do good things for others, have an understanding of right and wrong, function well in society, and have no particular desire to do anyone any harm. The fact that I believe their morality is based in laws originally given to us by God is irrelevant inasmuch as they do not believe there is an almighty or all-powerful force overseeing the universe and humanity. That being said, if someone whose behavior is brazenly criminal, corrupt, or immoral believes there is no God to answer to, the only obstacle they need to overcome is a human one. That makes them more dangerous than someone who believes they will be held accountable only if caught by man. On a more unified level, Communism in its most dictatorial form starts from a premise of Godlessness. The people (supposedly) rule and have no God to answer to. That has already proven to be dangerous. The flip side is the fanatical belief in God. The belief that anything can be done to humanity if it is in the name of God and if one’s interpretation is that God would want it done a certain way regardless of how unpleasant or even violent the action may be. It is far easier to see the damage religious zealotry has on the world, because it is an active force. I personally believe the leadership of the most violent and brutal forces on the planet are in it more for personal power and gain than anything else, but they appeal to the masses through religious dogma. The helplessness of much of the masses makes it an easy sell. Simply put, your life is bad? Devote yourself to God, do anything necessary to prove this devotion, and your life will get better. We’ve seen the results of this on a relatively small-scale. The larger the scale, the more devastation we will see. What it comes down to is the exploitation of faith. To those who understand what God is all about, be it a reality or a concept, the idea is to better your personal surroundings and as much of the world as possible. To those who use their belief in God or their disdain for anything religious to promote a negative agenda, they are using their beliefs to reinforce their personal ambitions. Maybe this does more to show that people are either good or bad than it does to prove the existence of God, for believing in God or refuting God’s existence is clearly not always the difference maker in how people act, be it good or bad. Either way it proves one thing above all else. 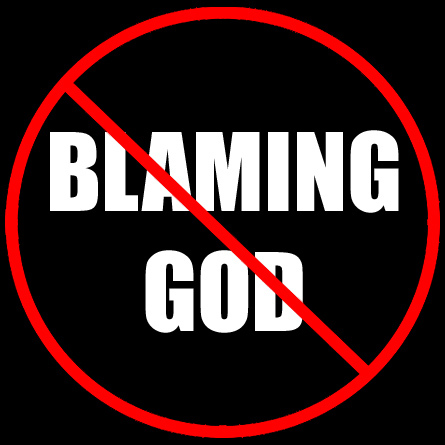 It’s not God’s fault.